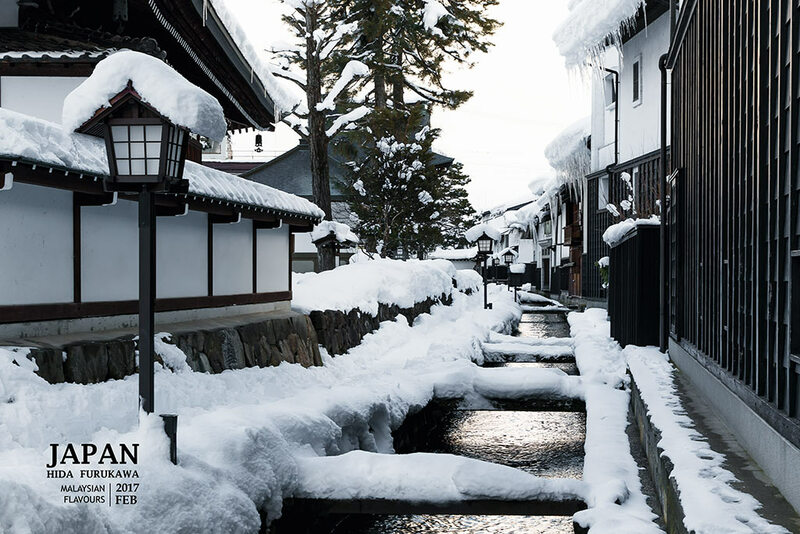 Hida Furukawa 飛騨古川, a small town located in the Gifu prefecture of Central Japan, just 15KM from Takayama. 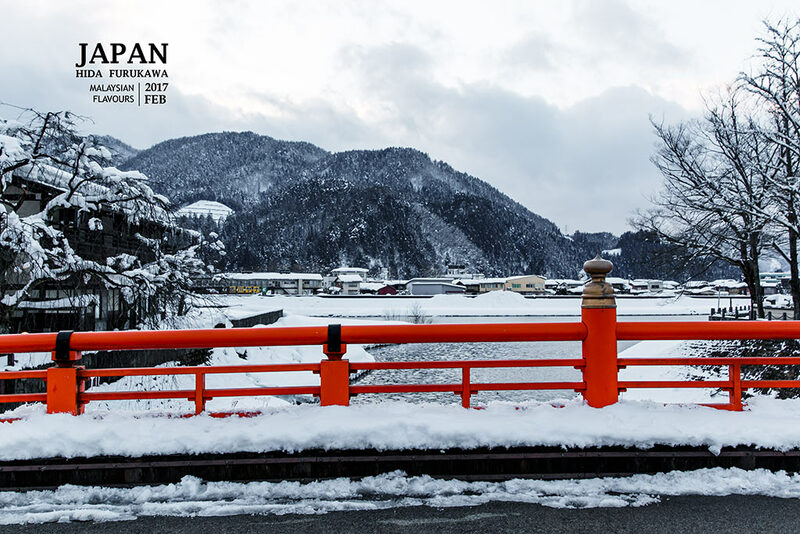 It is a calm and relaxing place famous for well-preserved traditional wooden houses in old town, koi fish swimming in canals, beautiful temples, alongside with skillful craftsmanship that carries long history, and most importantly, annual Furukawa festival that brings the town alive. 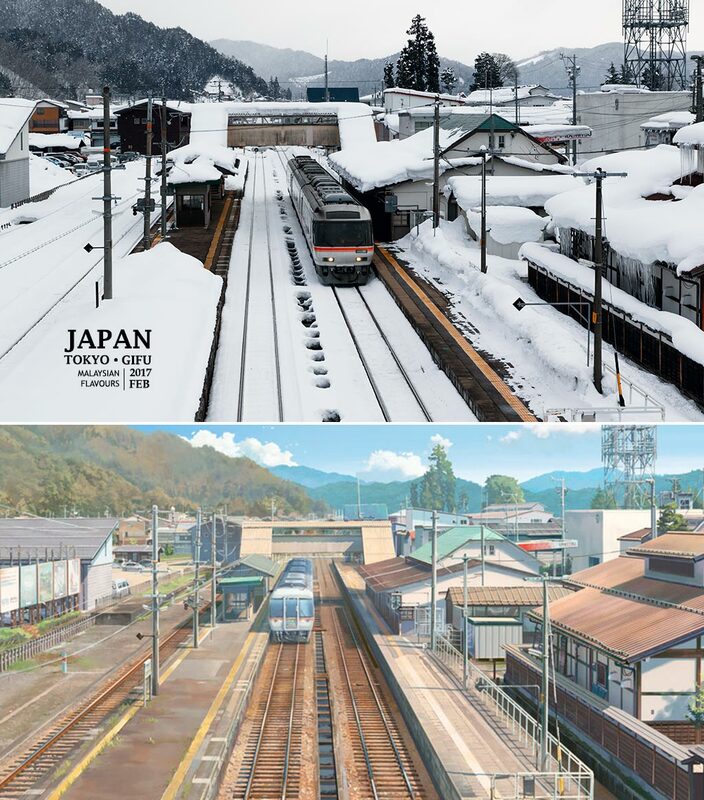 Comparing to Takayama, Hida-Furukawa used to have less visitors but ever since the anime movie – Your Name ( Kimi no Na Wa 君の名は) made its name in the world, anime movie fans and tourists flock to this little town to have a glimpse of Miyamizu Mitsuha staying place, as well as getting to know Hida-Furukawa better. 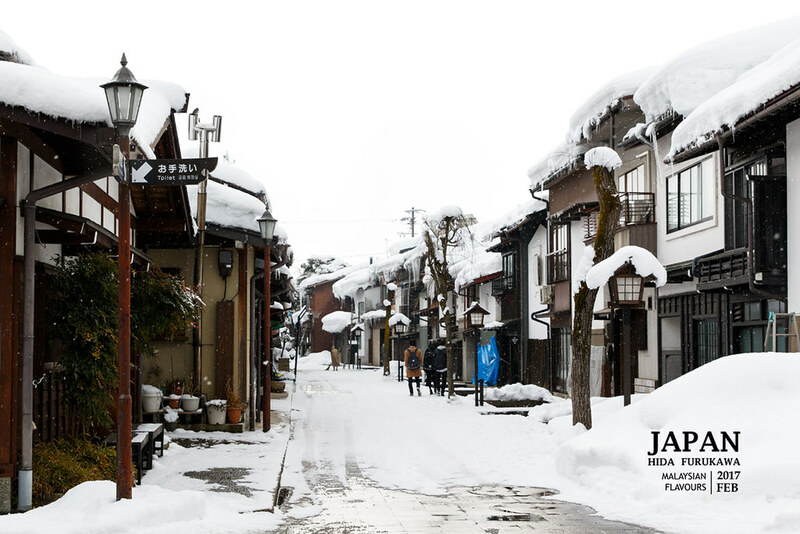 Hida-Furukawa is also accessible from Japan major cities including Osaka, Tokyo and Nagoya. 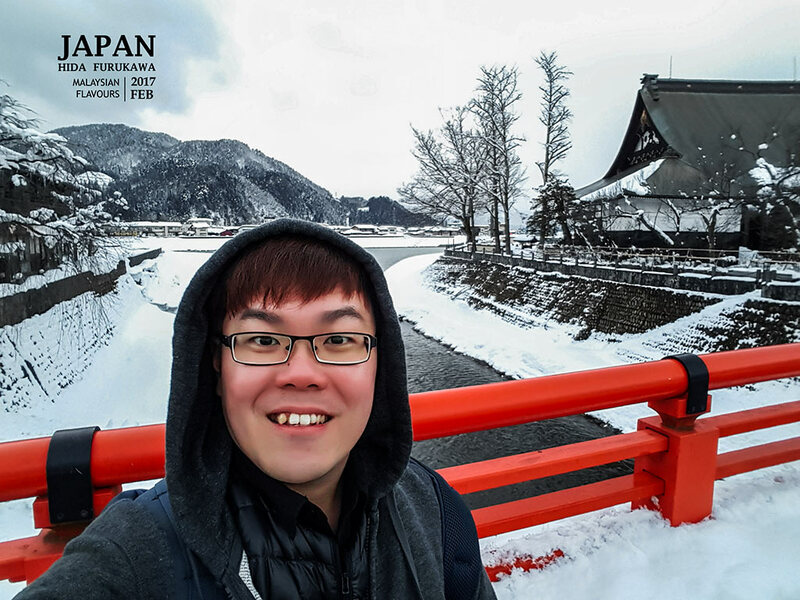 Easiest by train, for example Tokaido Shinkansen that served by Nozomi, Hikari and Kodama bullet train. 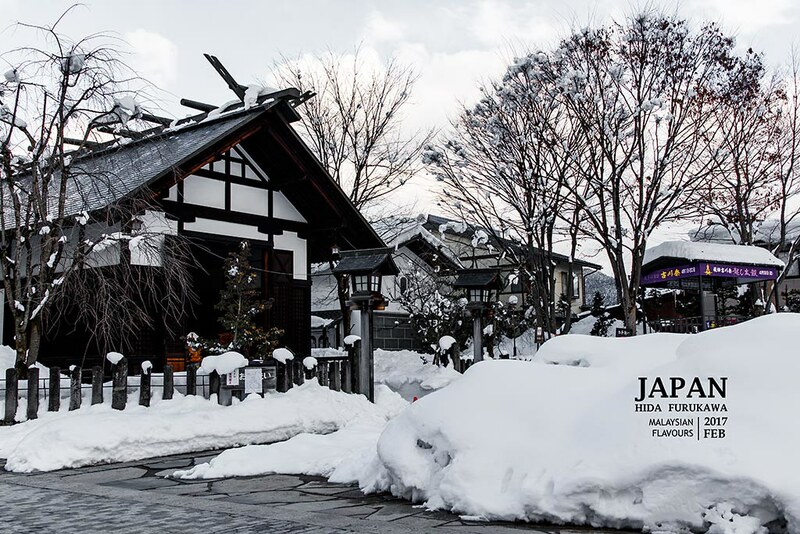 It is best to combine your Hida-Furukawa trip with Takayama, as these two places are just 15KM apart each other. 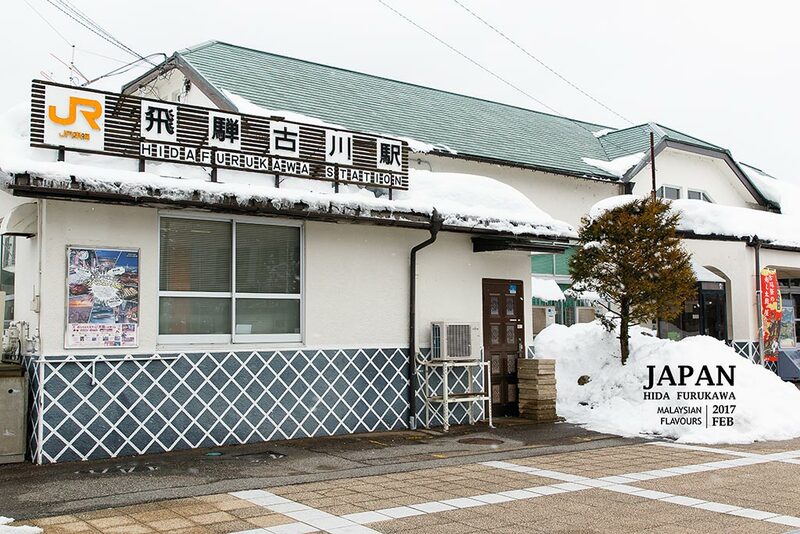 Reaching Hida town from Takayama is fairly easy, just ride on JR Takayama Line, stop at JR Hida-Furukawa station. Spending time on train is only 16minutes with scenic view along the way. 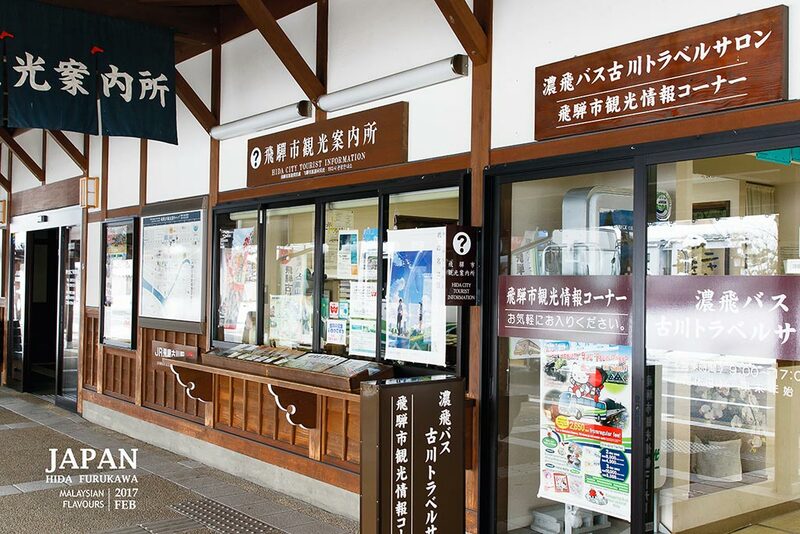 Once you reach Hida-Furukawa Station, there is a tourist information centre on your right. 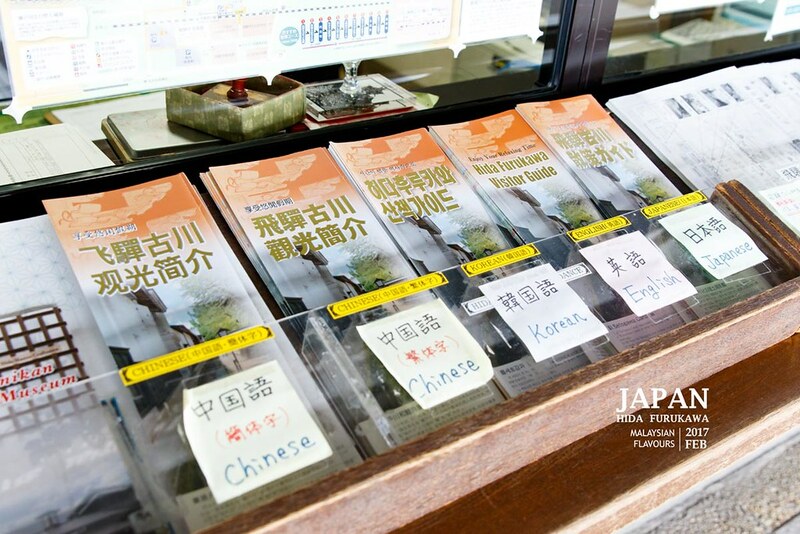 Tourist maps are substantial, available in various languages to suite visitors from different countries. Grab one and you can start exploring the town by foot. 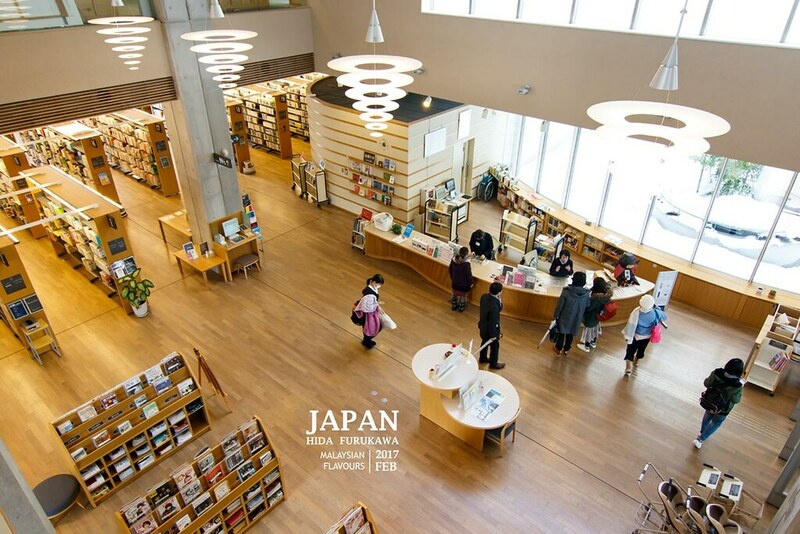 Tourist Information centre next to JR Hida-Furukawa station. Map in various language available. 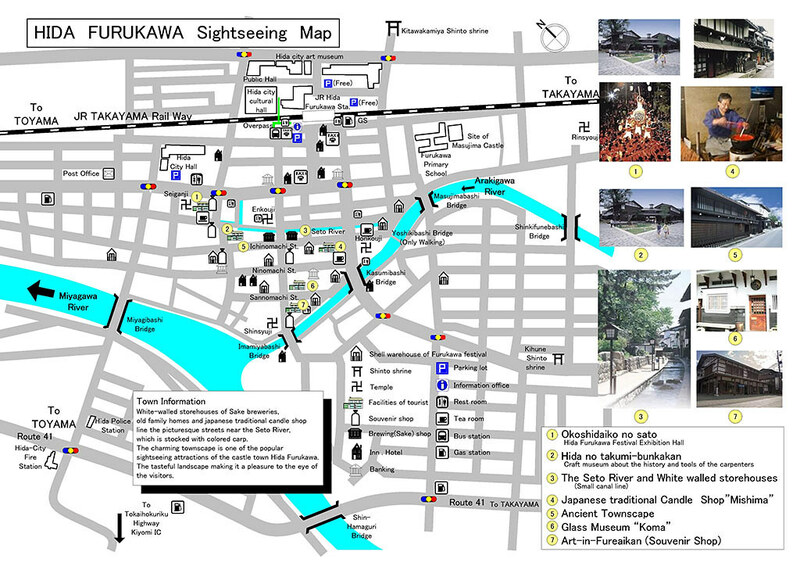 Click High Res Hida Sightseeing Map for a better illustration of the town. 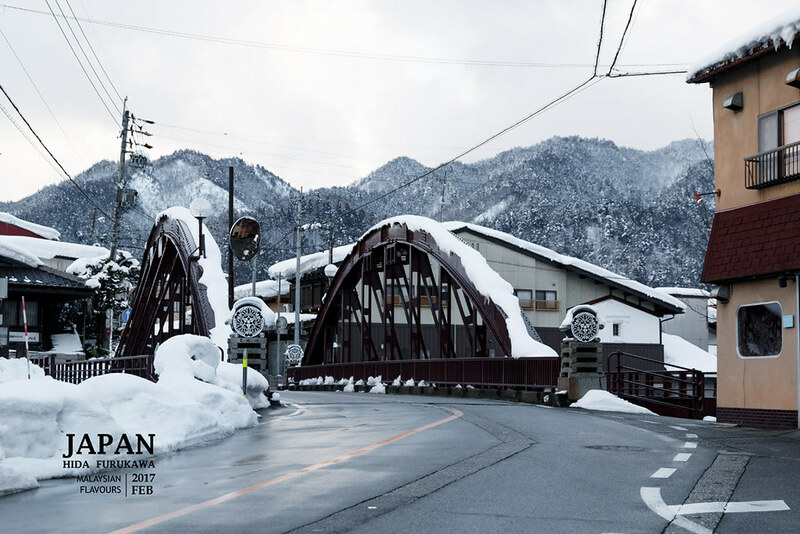 First thing first, Hida-Furukawa Station itself is now a proud tourist attraction, as this is the station where Taki and his friends stopped by when travelling to Itomori, Mitsuha’s hometown in the movie Kimi no Na wa. 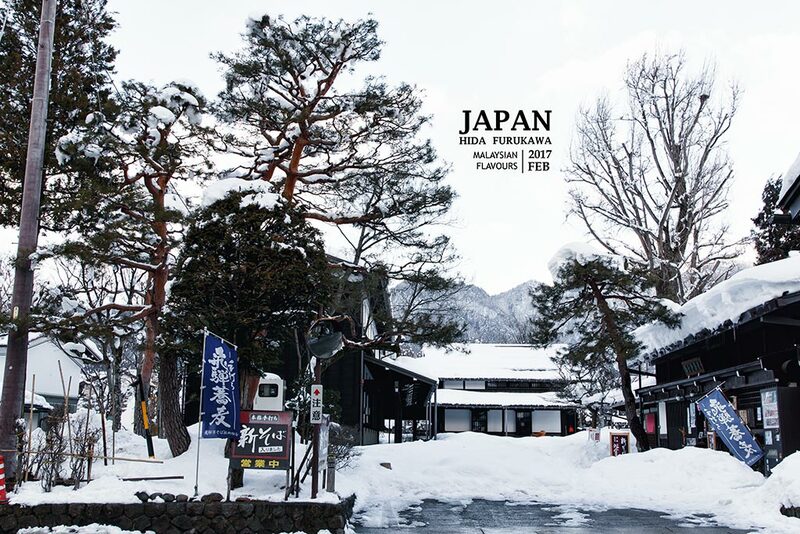 Japan tourism is thoughtful enough to have the best spot marked, so you know where to capture the scene in real life location. 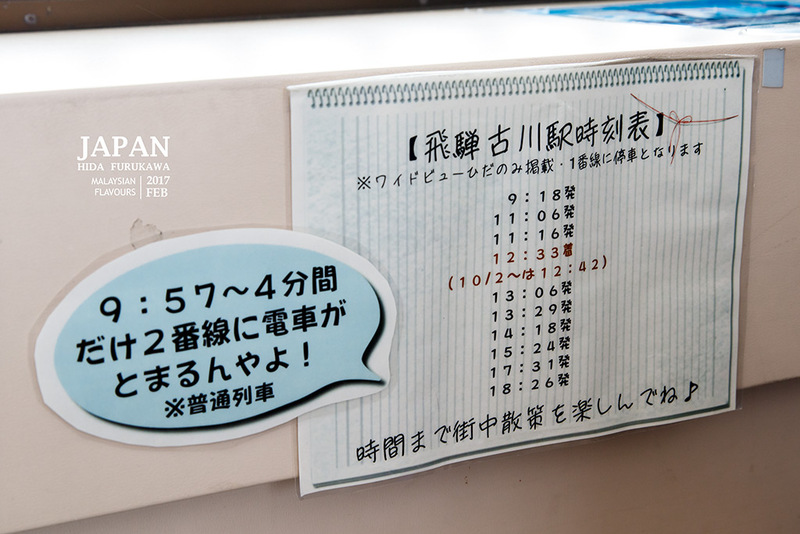 They even prepared the train timetable where the train will stop by the station for your easy reference. 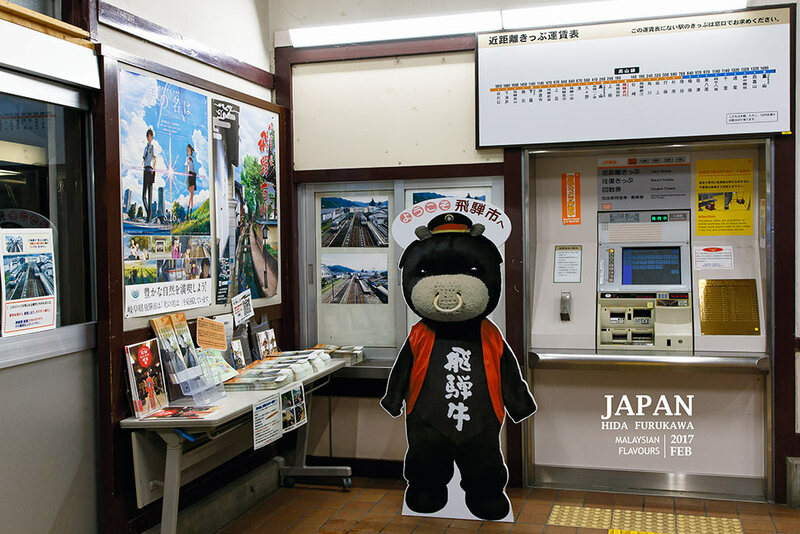 Taki and his friends asking for direction of Itomori town. 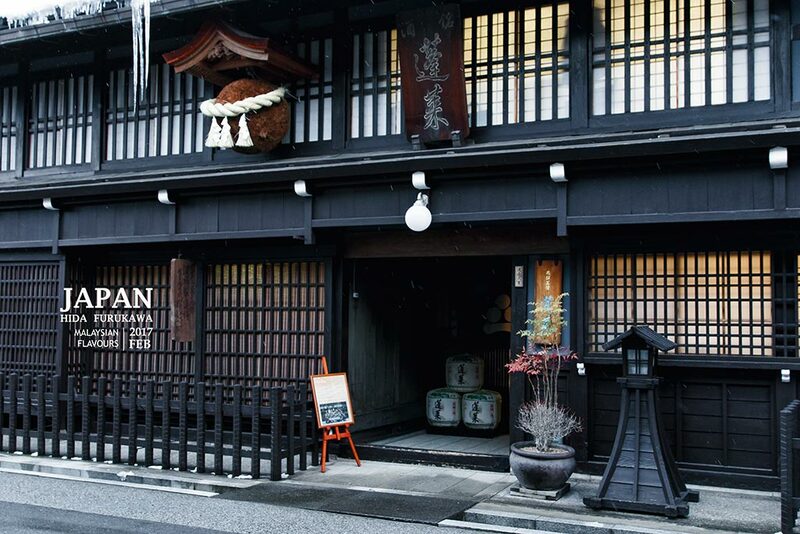 Carpentary has long been a specialty of Hida.For centuries, Hida-Furukawa is fame for skillful craftsmanship. People from Hida are sent to capital cities in Japan to build temples, and they came back with exquisite skills and techniques. They were named as “Hida no Takumi” or “Hida’s Master Builder”. 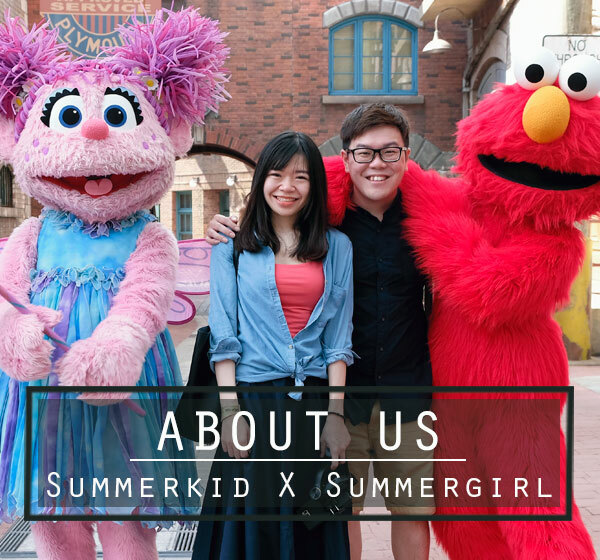 Get to know more about their skills in this musuem. 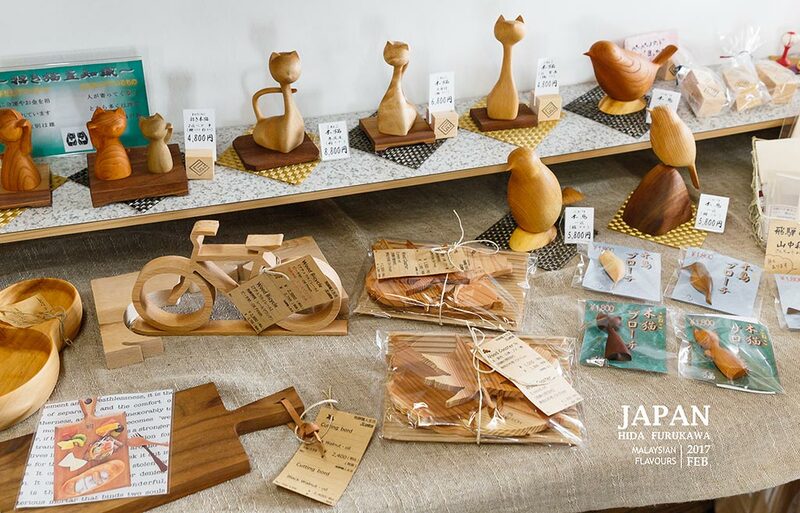 Hida Crafts Museum (Hida no Takumi Bunkakan) exhibits the tools and techniques used by local carpenters. The museum itself is built without using even a nail. We get to experience how no-nails-building can be formed by fitting these posts and beams of miniature wood frame puzzles together. 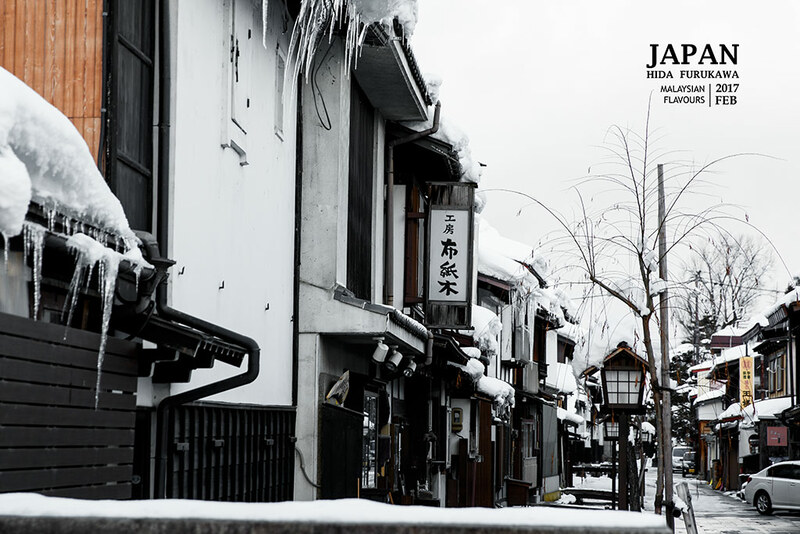 Ichinomachi Street, Ninomachi Street and Sannomachi Street are the three main old streets you must explore in Hida-Furukawa town. 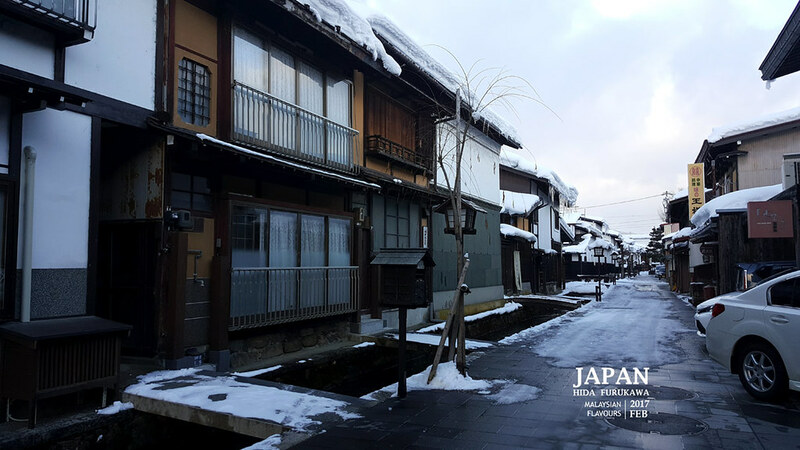 Traditional wooden houses on both sides, we felt like walking in Edo period, transporting back to the old times. 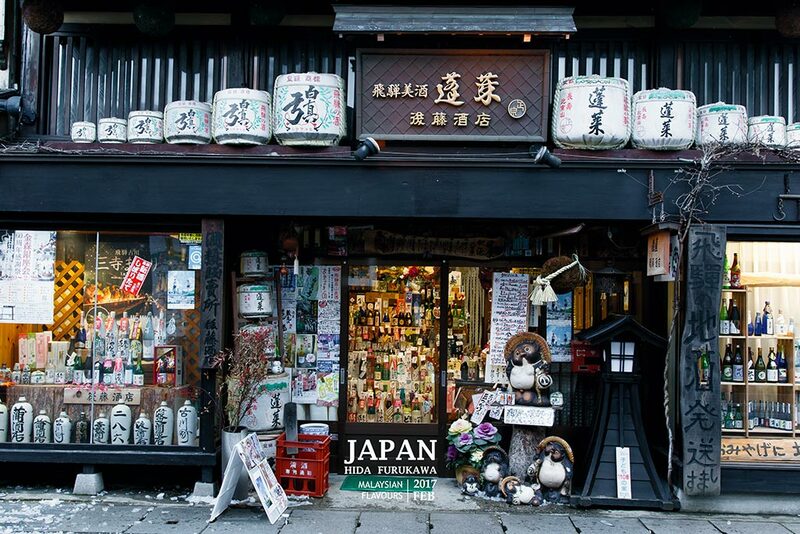 Some shops also offer kimono rental, so get blend into the Japanese culture with beautiful backgrounds in the Shirakabe-dozo areas! 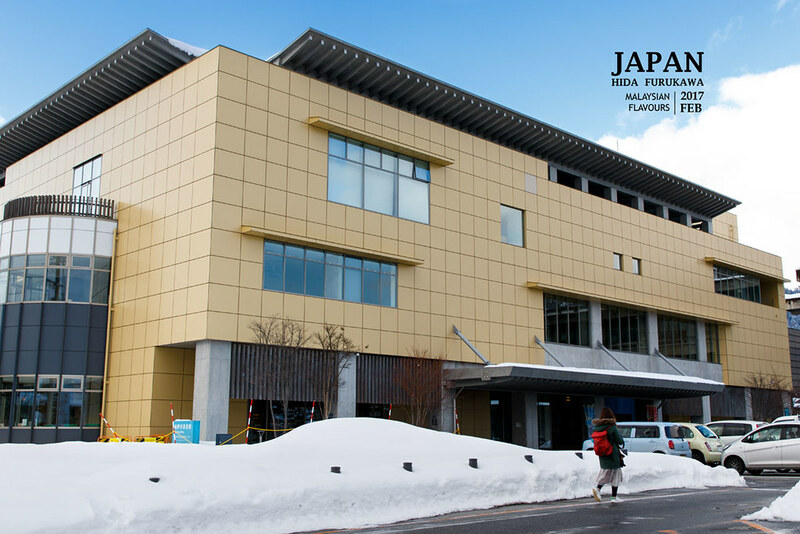 Hida used to have more than 10 breweries but by now, there’s only few left – Watanabe Sake Brewery and Kabe Sake Brewery at Ichino-machi Street of Hida-Furukawa; Otsubo Sake Brewery at Kamioka-cho. 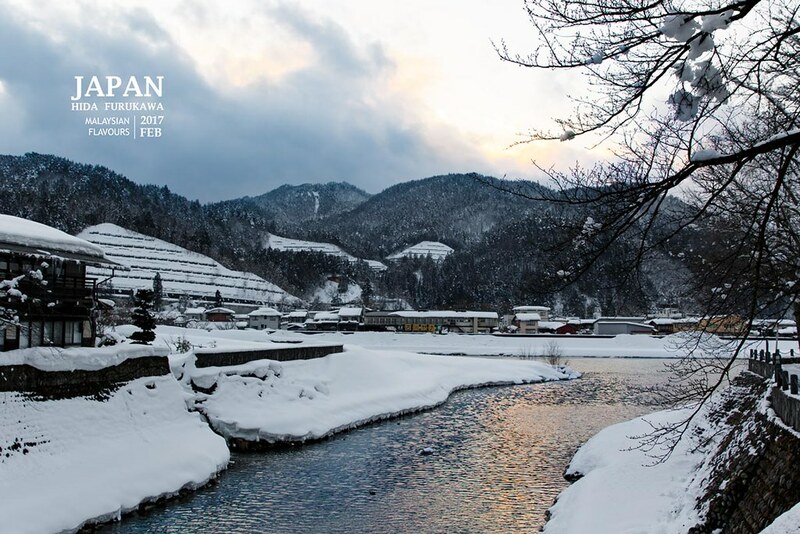 Due to its cold weather, clear water, good rice and excellent brewer, both long-established brewery are always famous for their high quality sake. One of the fun thing that you can observe from the brewery is Sakayabashi, a large ball made from Japanese cedar leaves, hung at under eaves of sake brewery front door. 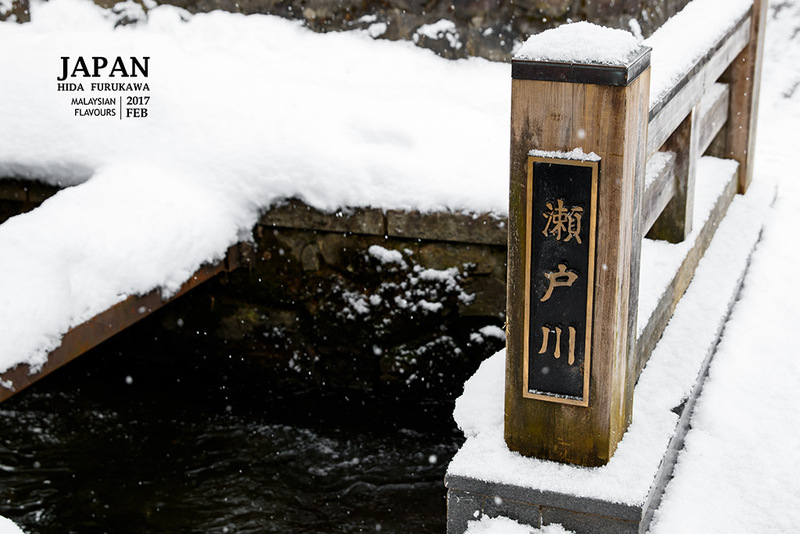 When a fresh, green ball is hung in late November, it signifies a new sake is being brewed. The leaves will slowly turn into brown as the maturing process of sake takes in. When the ball turns complete brown, sake is ready. 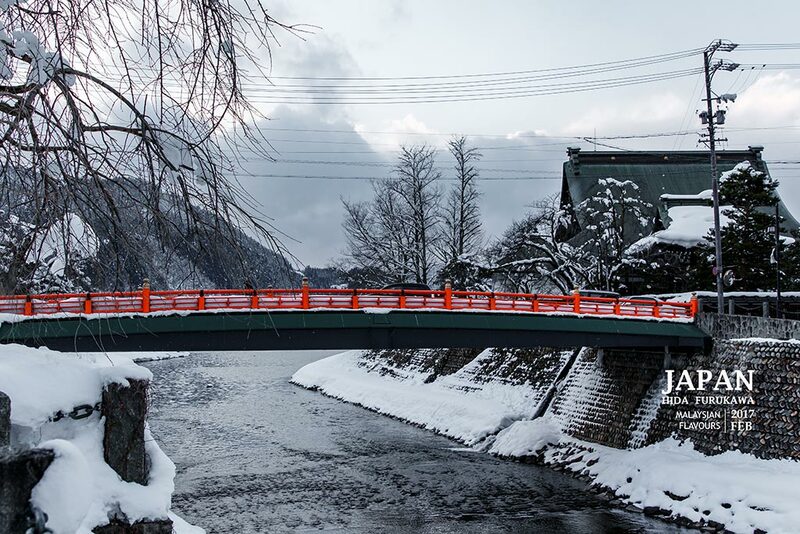 There are about 800 carps swimming in Seto-gawa waterway, a river flowing through the town. If you observed deeper, you’ll realize that all these fishes are swimming in just one direction. Even if you feed them with food, the swimming directions are not disturbed. Amazing. These carp in the river is an effort to keep the river clean, started since 1968. This is because it was once deeply polluted during high economic growth period. No carps during our visit, as they are moved away in winter to a pond and will be returned to the river in spring. 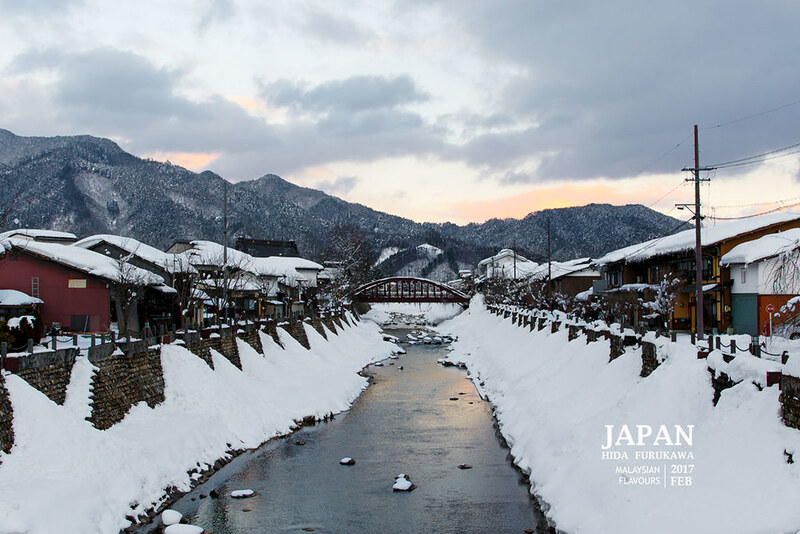 The canal in Hida-Furukawa is lined with white-walls clay storehouses on one side, framing a picturesque landscape to the town. 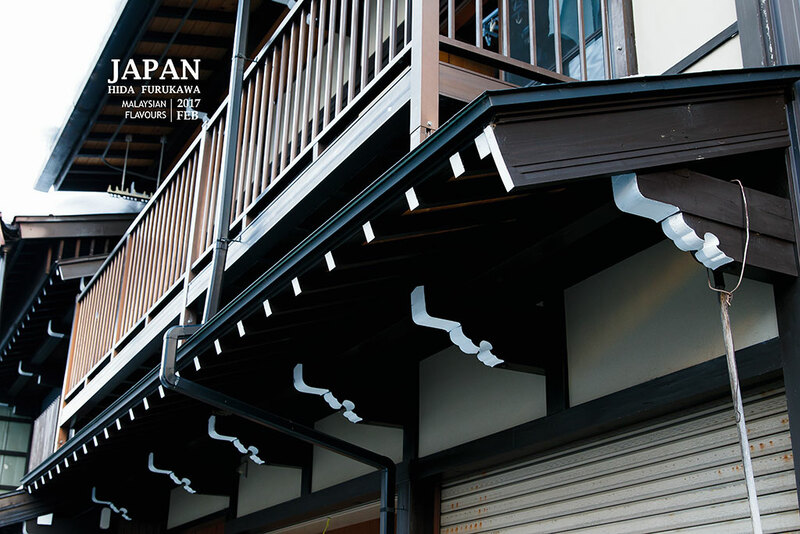 These float storehouses, or Yataigura are used to store float that are used during Furukawa Festival. 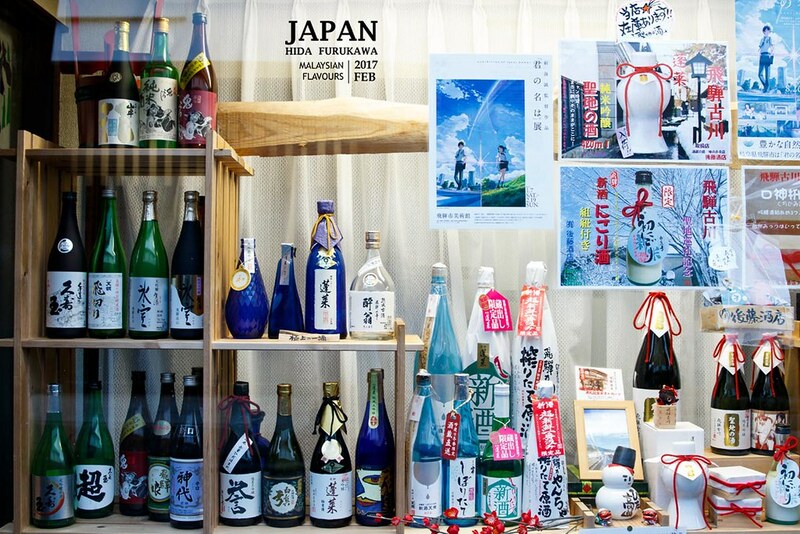 Since floats are very delicate, they need to be stored in humidity controlled place. This is why storehouses are very important. Overlooking the beautiful sunset on the bridge. 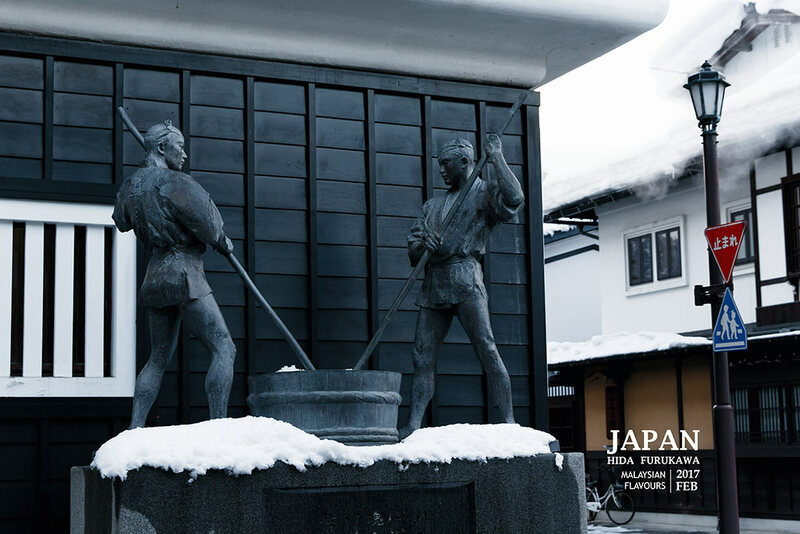 Besides visiting Hida Craft Musuem, you can also appreciate the skills of Hida no Takumi as you walk around the town. 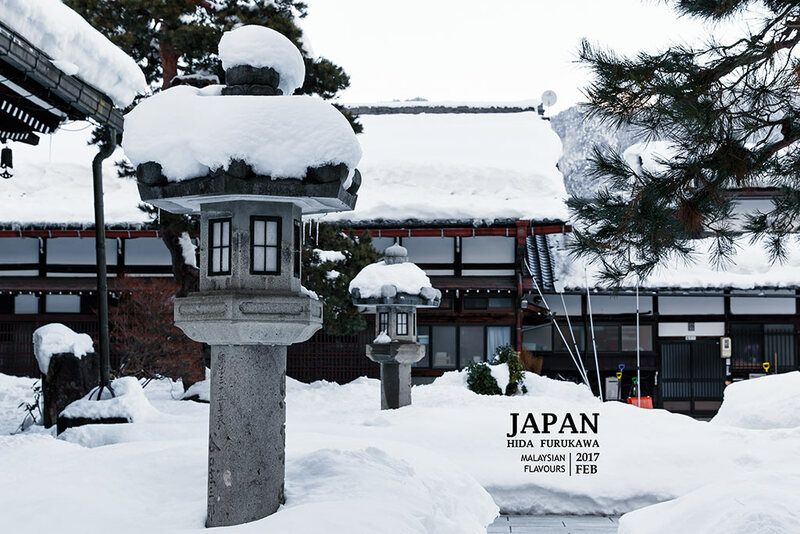 Check out some of The architectures in Hida-Furukawa with “cloud” (kumo) carvings, decorating the building he built with same pattern – an artwork that symbolizes the carpenter’s glory. 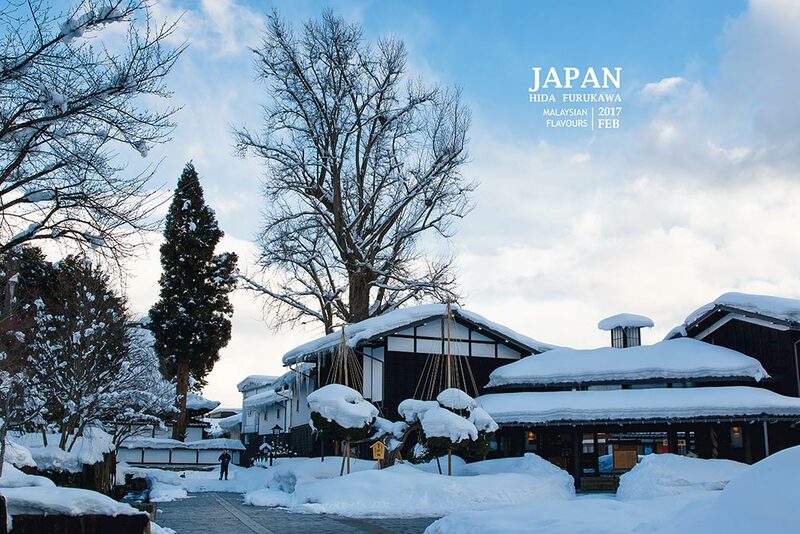 According to information from Hida-Furukawa Guide & Map, there are about 170 types of cloud patterns are said to exist now. 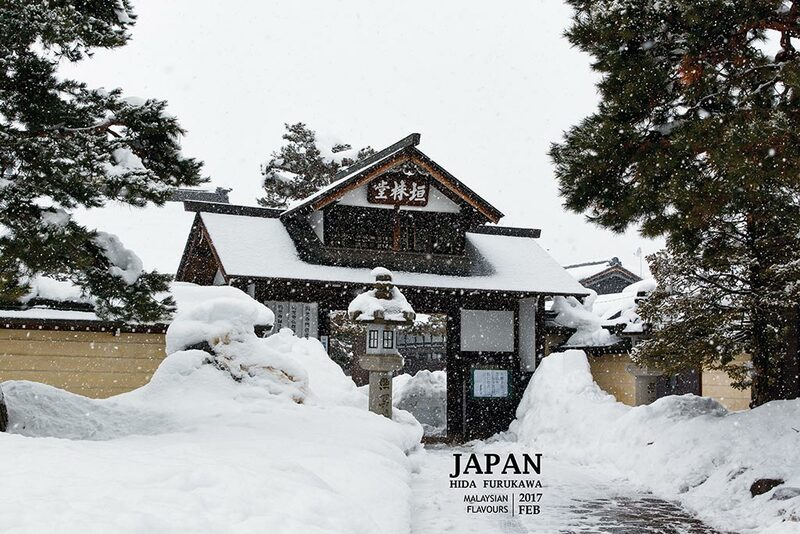 Hida-Furukawa has three major temples, namely Enkoji Temple, Shinshuji Temple, Honko-ji Temple. 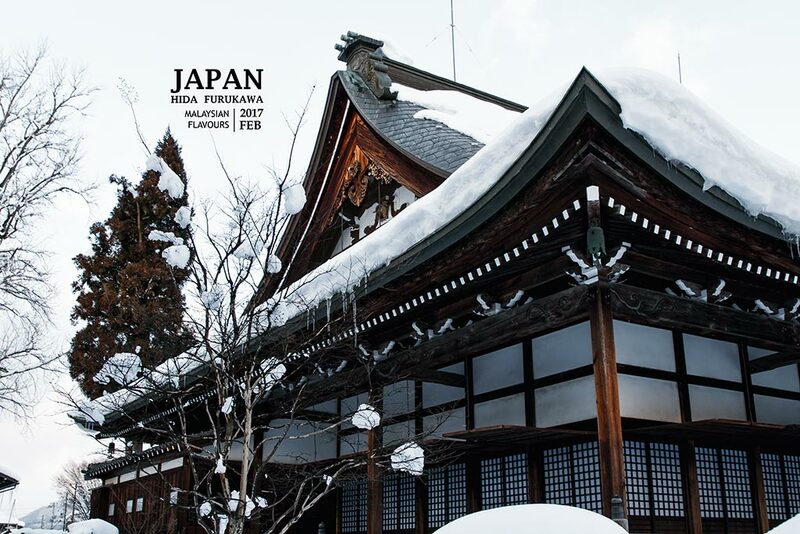 These temples are especially important in 15 January each year, when Santea Mairi takes place. 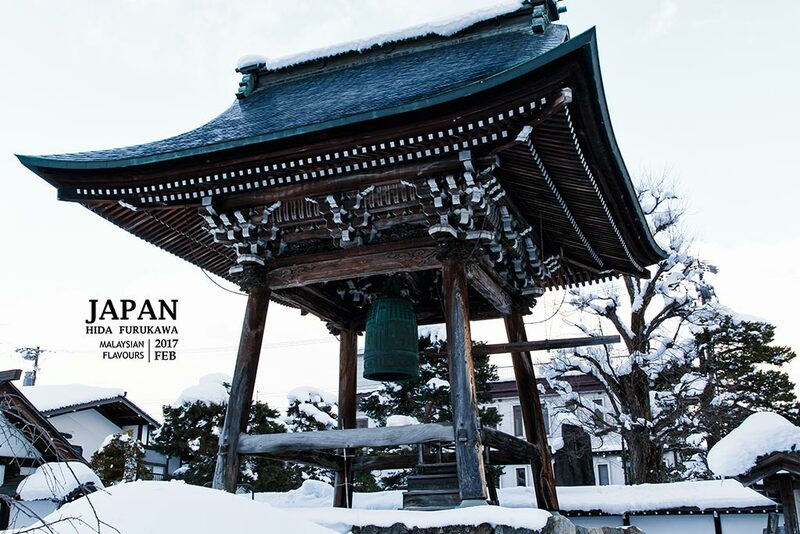 This over 200years Buddist practice focuses on making a pilgrimage to Enkoji Temple, Shinshuji Temple, Honko-ji Temple in one night to pay thier respects. 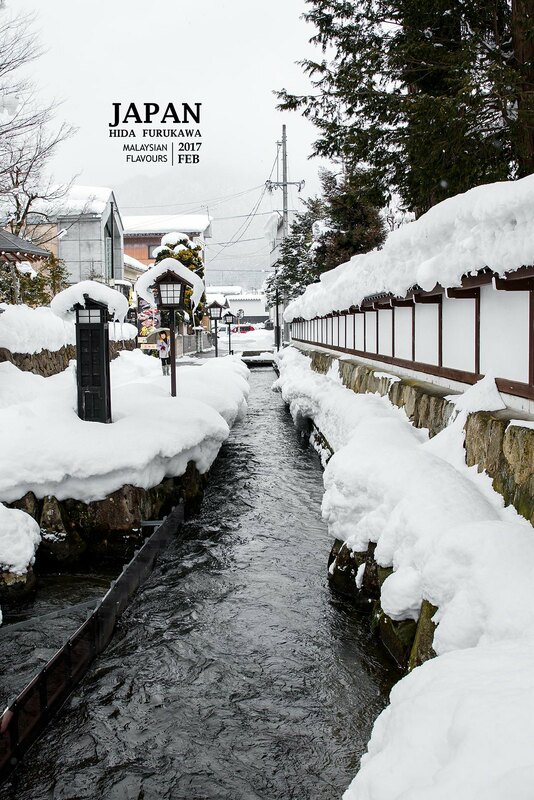 During Santea Mairi, more than 6 feet tall snow candles are lined up in a row on the main streets, and many candles along Seto-gawa canal. 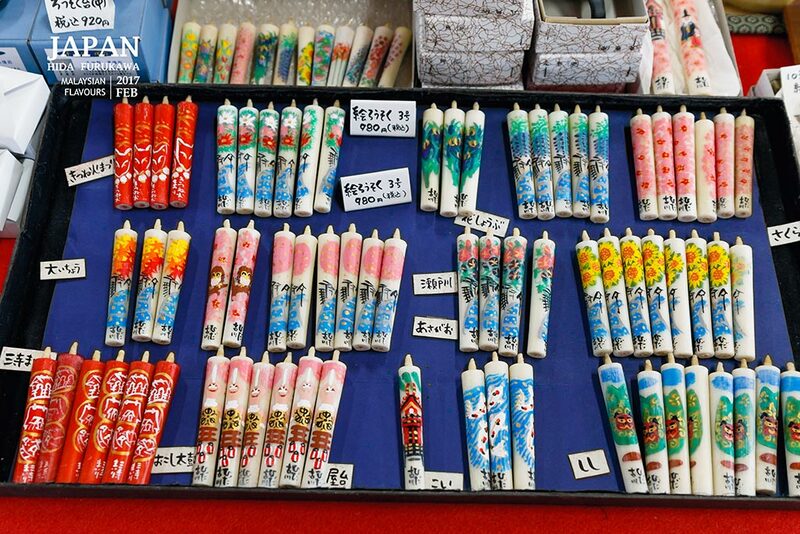 Female participants will dress beautifully in kimono, and many of them found matches in the evening. This makes the event slowly raised to become reputed for kindling romances. 11-11 Furukawa-cho Tono machi, Hida City, Gifu Prefecture, Japan. 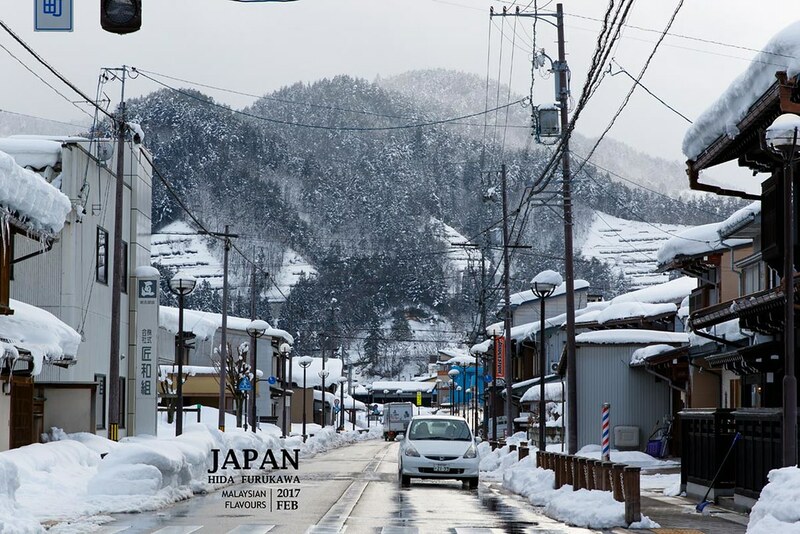 1-17, Furukawa-cho Ninomachi, Hida City, Gifu Prefecture, Japan. Yes, food! 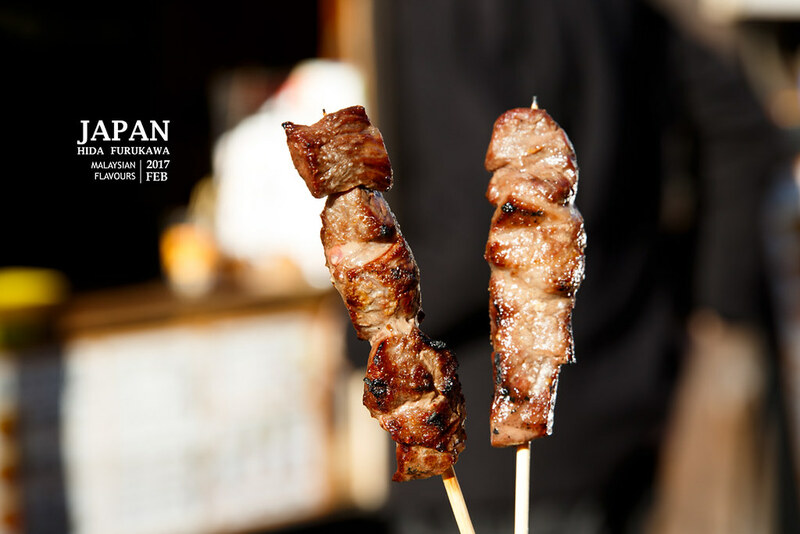 When in Kobe, eat Kobe Beef. 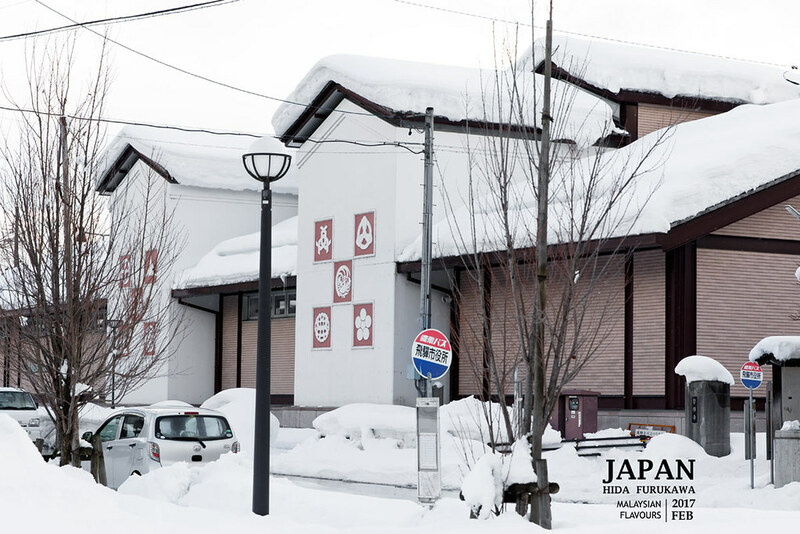 When in Hida, eat Hida Beef. LOL. 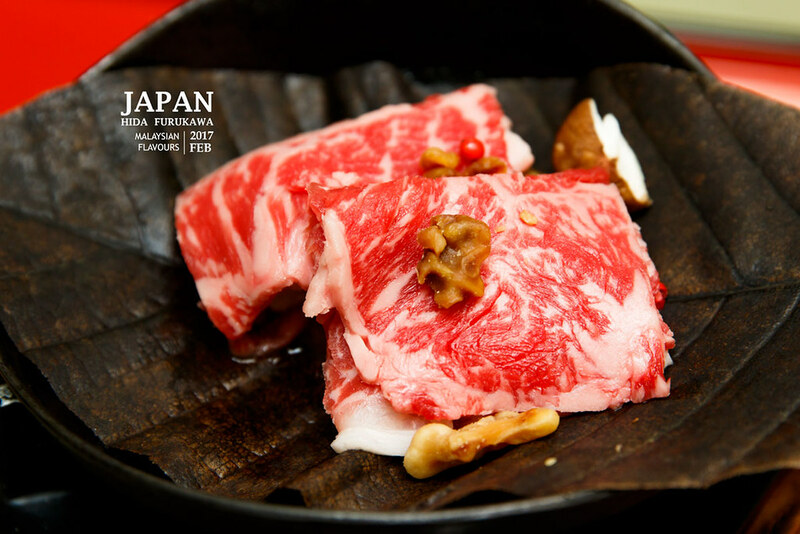 Stop by at Okadaya and enjoy gohei mochi and Hida Beef coated with special sauce. Or sample made-to-order beef croquettes at Hida Korokke Honpo. 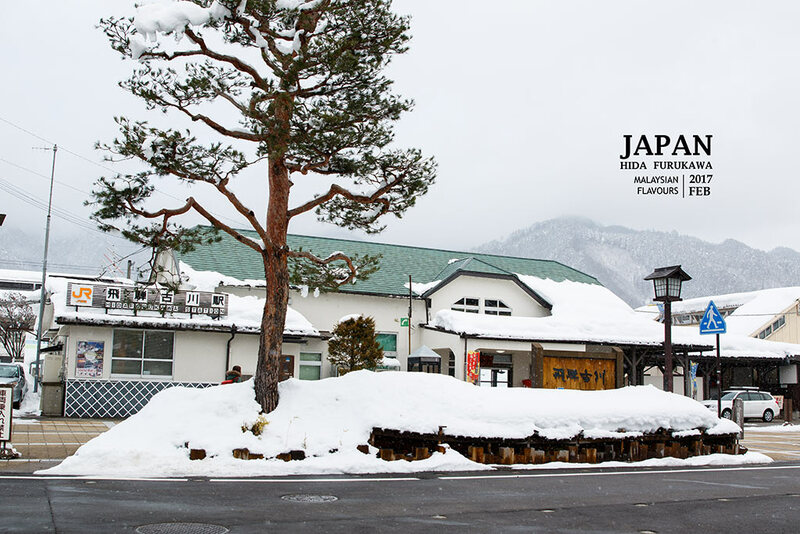 We didn’t get to try them out, so we compensate this disappointment at Takayama. 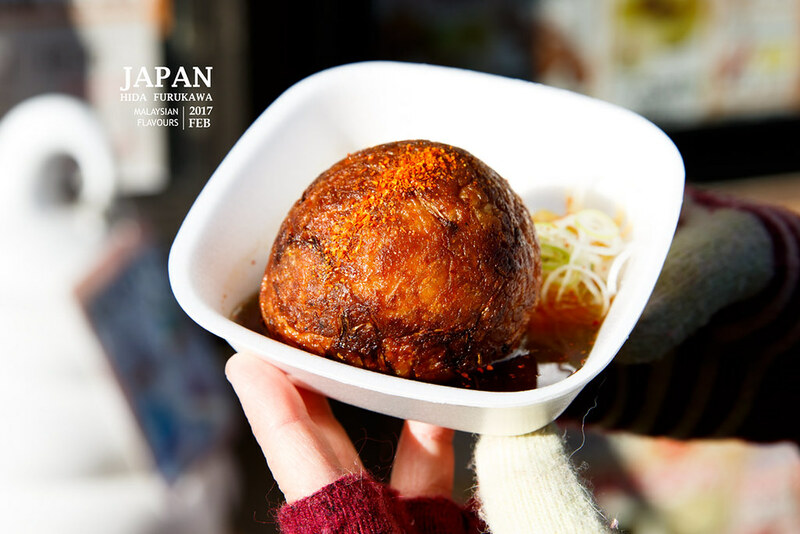 Beef Croquettes in Gifu is really delicious!!! 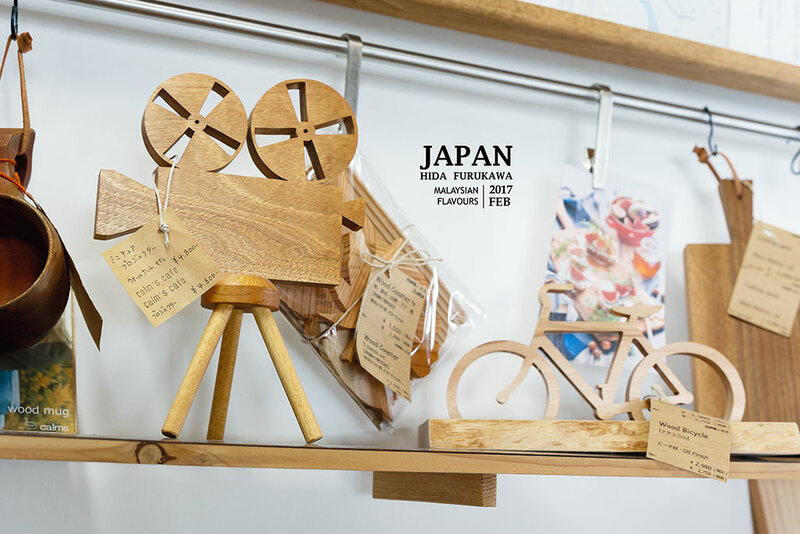 So don’t miss them out when you are in Hida Furukawa too! 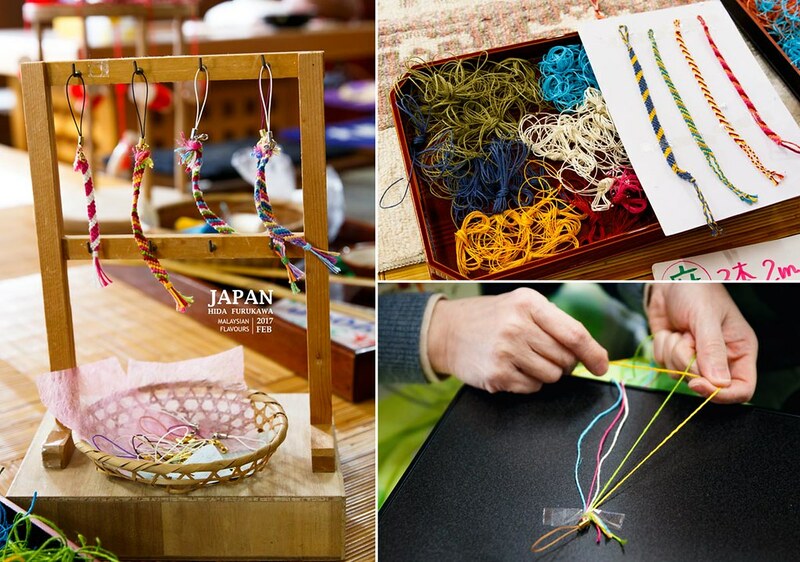 In the movie Kimi no Na wa, Mitsuha is good at braiding under the taught of her grandmother. 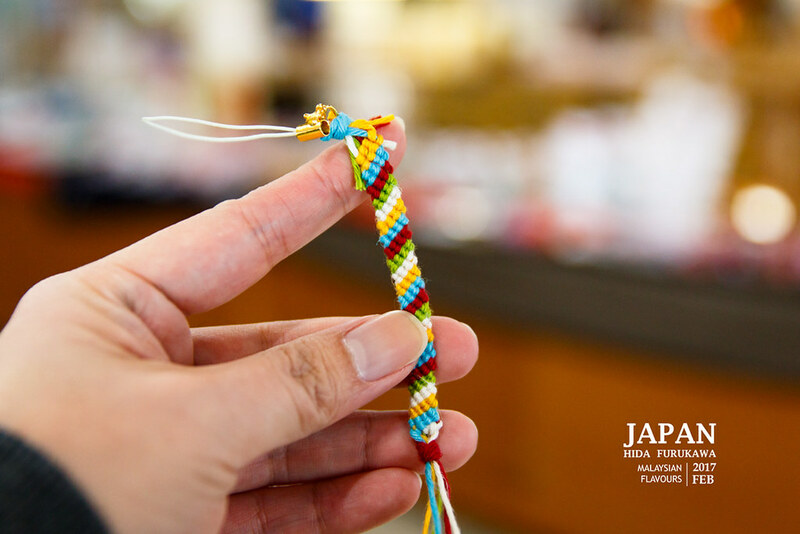 We had hands-on experience on “converse, take shape, twist & tangle” at Hida Sakura Gift Shop, only 500yen per class session. And here’s the lucky charm that I made!! 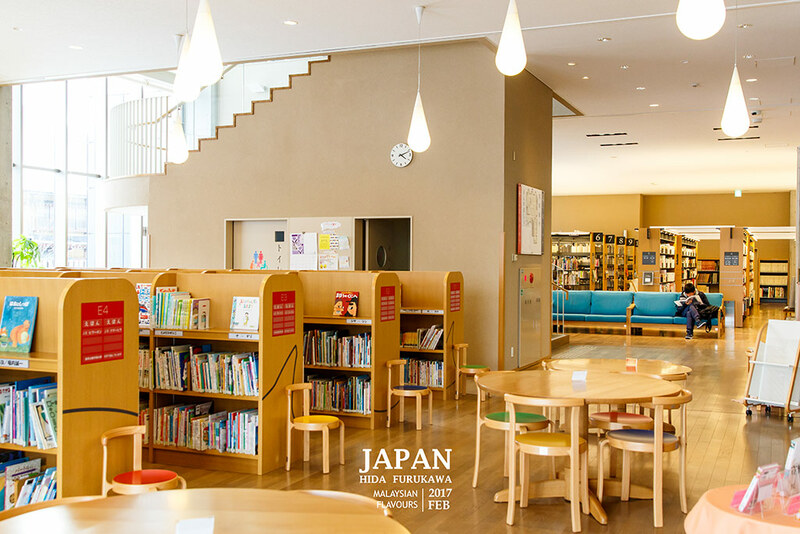 Very beautiful library. 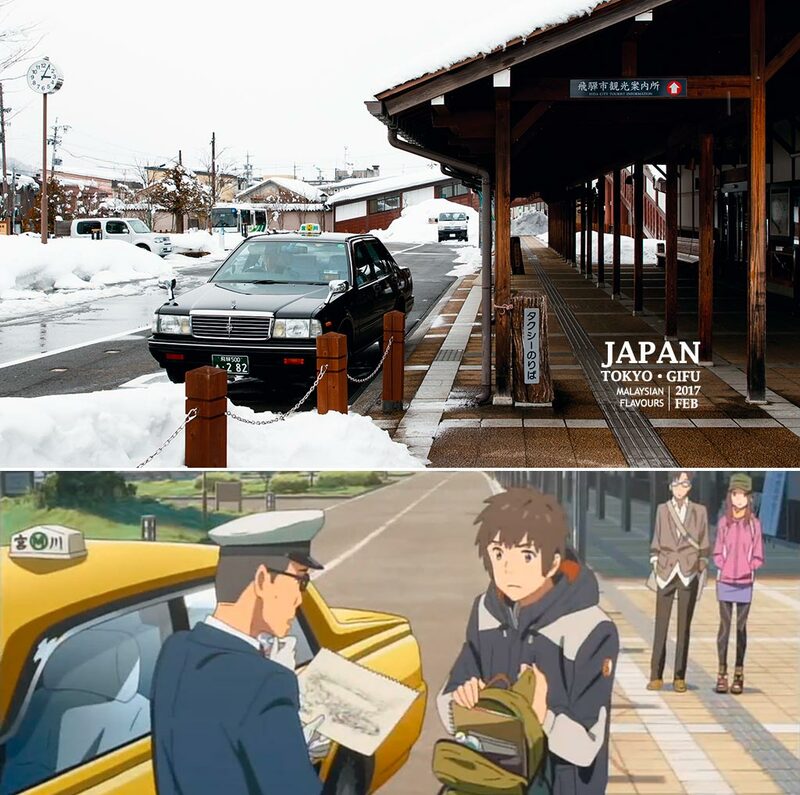 This is also one of the important scenes in the movie Your Name – the place where Taki looking for more information about the tragedy of Itomori town, and found Mitsuya on the victim list. 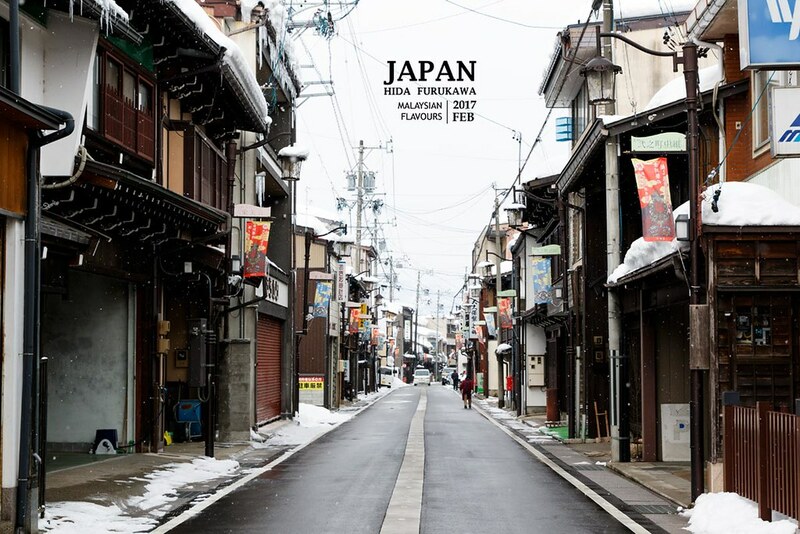 Woodwork well represents Hida-Furukawa, but candles (warosoku) from Mishima Japanese Candle Shop are not shadowed too. 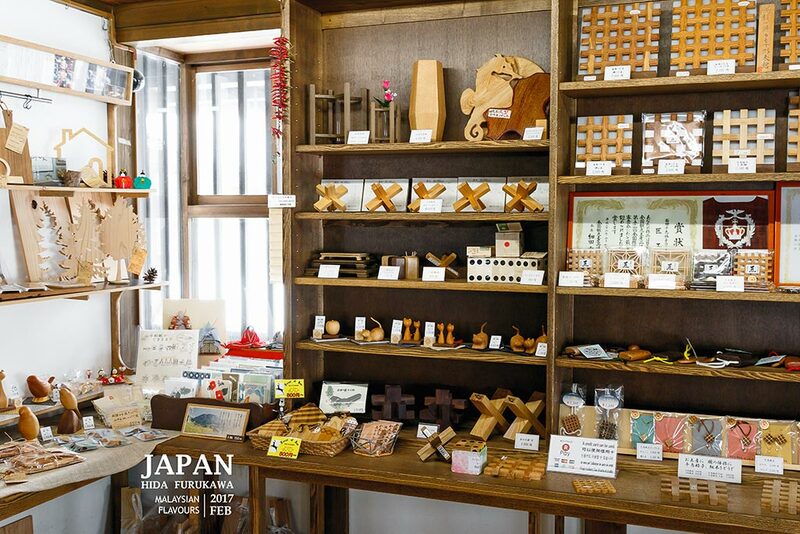 This shop, which is now located in the charming old-town of Hida Furukawa has been in candle making business for more than 240 years, currently run by the 7th generations. 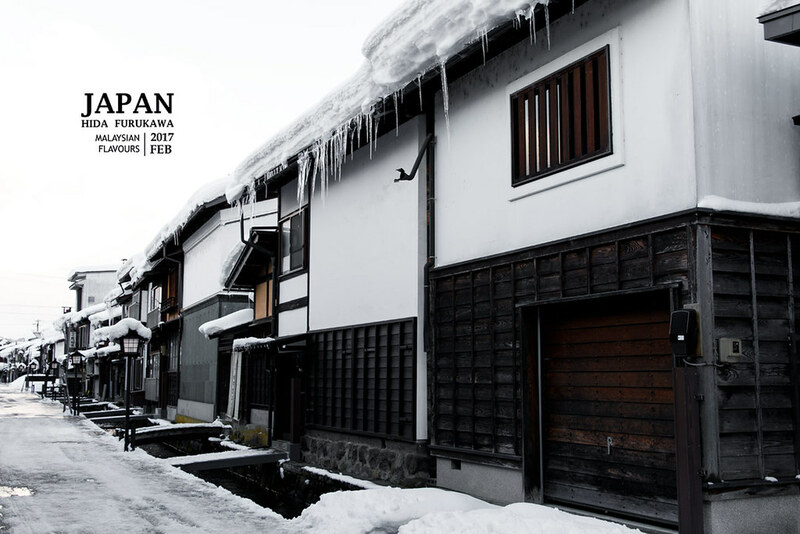 There are less than 10 shops in Japan that produces handmade candles, and Mishima Japanese Candle Shop is the only one in Hida that painstakingly handmade their candles in all processes. Bring home one or two beautiful candles, light it up and have a piece of mind with the swings of candles. Next to Fukuzenji Soba, somewhere near Eekoji Temple, it is impressive to find a 700 years old Gingko Tree. Too bad it wasn’t blooming in beautiful yellow when were were there, but bald with just tree branches. hahaha. 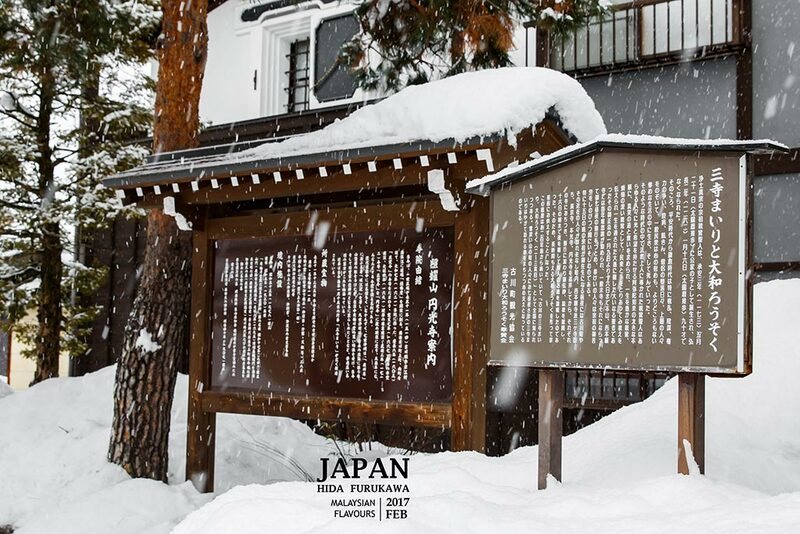 There is a 1200 years old Gingkgo Tree in Takayama town too, inside Hidakokubun-ji Temple. 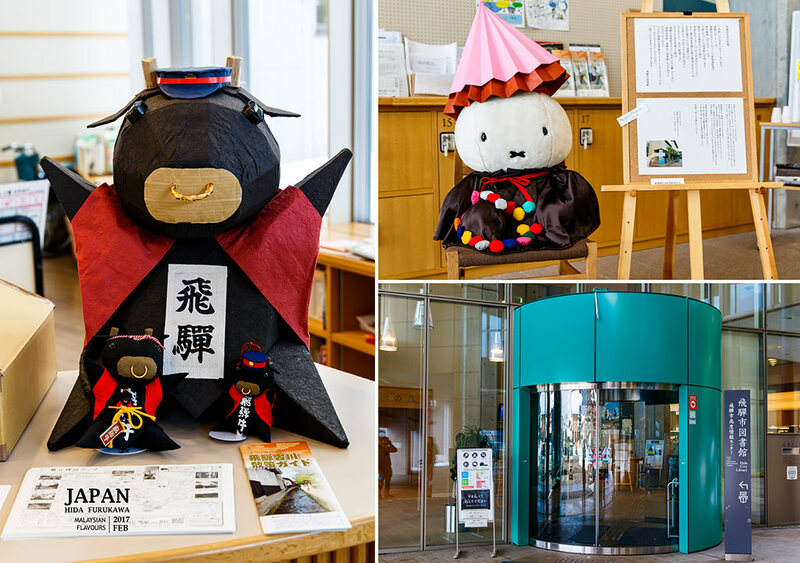 Hida Furukawa Matsuri Kaikan, or Hida-Furukawa Festival Museum, is a must-visit attraction that displays a gallery of the most important annual event in this town Furukawa Festival, also registered on UNESCO’s Intangible Cultural Heritage List. 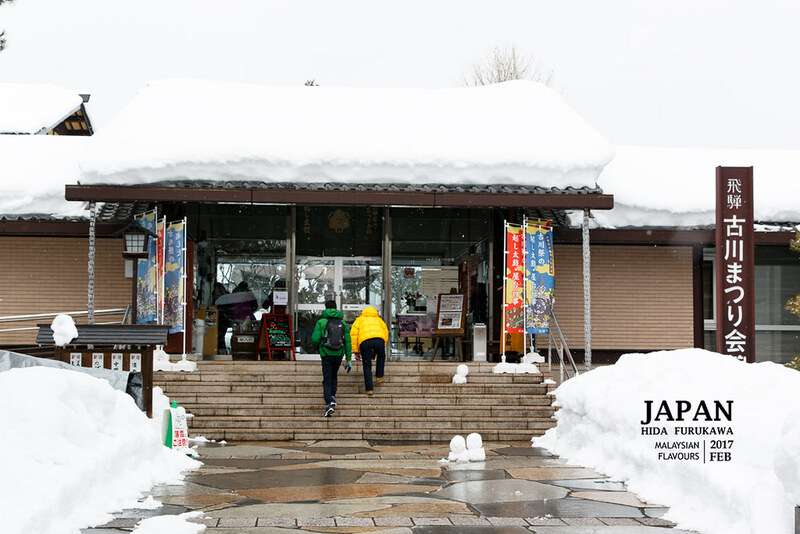 The festival is held on April 19th and 20th. 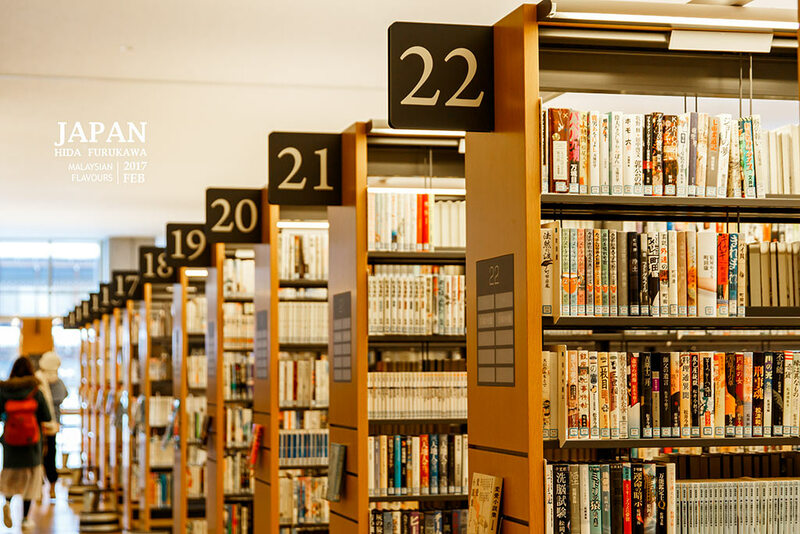 Gain an insights knowledge about this spring tradition, and also have a look at real festival floats used in the event. Okoshi Daiko performance sees more than a thousand of people with lanterns, few hundreds of barely dressed men, go through the street carrying a wooden tower. They hold a small drum called Tsuke Daiko, and charge towards te big drum. 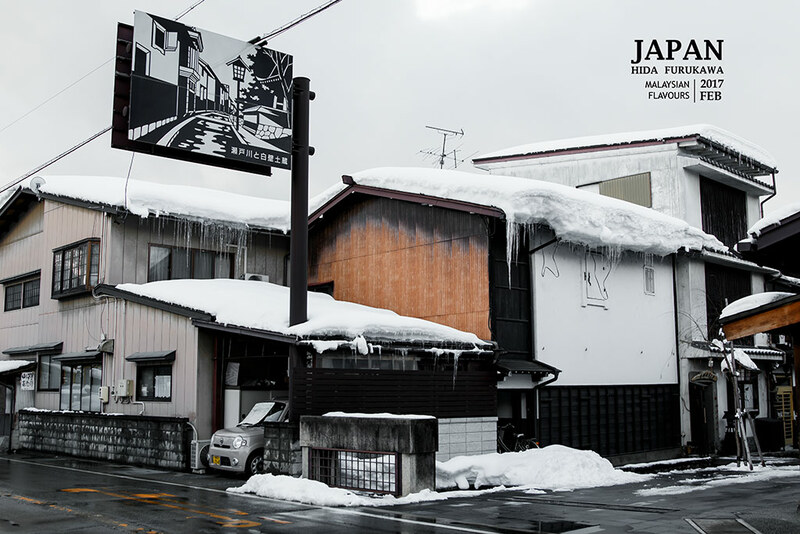 14-5, Furukawa-cho Ichinomachi, Hida City.